D.I.D VX2 Kettingset KTM 250 SX-F is toegevoegd aan uw winkelwagen. 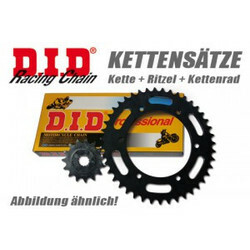 Suited for KTM 250 SX-F, 07-09, etc..
D.I.D. Extremely strong, durable and efficient. The chains are renowned for their high efficiency combined with smooth, fast reaction to load changes the result of years of development work for the race track plus state-of-the-art production methods and top-quality materials. The rigidity of a chain means its ability to resist deformation and stretching. The secret behind the astonishing performance of these chains is D.I.D's exclusive hardening process for the pins. This special treatment produces an extremely hard surface layer, while maintaining a softer inner core. These chains combine extreme impact resistance with efficient shock absorption. In addition, they are well protected against rust. 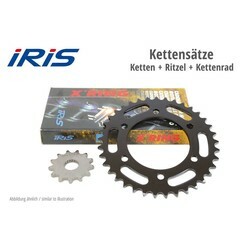 The specially shaped sealing rings significantly alter the friction area of the side plates. At the same time, doubling the number of sealing points from 2 to 4 has the effect of safeguarding far more effectively against lubricant loss, and also provides optimum protection against dirt.